I can’t believe how time flies! We're about to exit January and zoom in February and Black History Month! Each February the United States observes Black History Month. This month is intended to honor the history, struggles, and triumphs of black people in America and across the world. Pump It Up Magazine is proud to honor Dr. Martin Luther King and the many icons who have made African American Heritage rich with their sacrifices, courage, and love for this country. We also recognize and appreciate the musical and artistic contributions from the many artists and clients of Pump It Up Magazine. 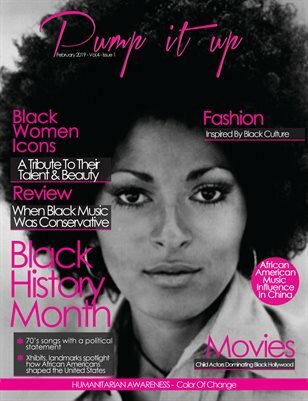 On the cover, this month is the Iconic Pam Grier who’s talent and beauty speaks for itself to the African American story. We hope you enjoy this special edition and oops before I forget- Happy Valentines Day!